KUCHING, Sarawak, Malaysia, May 20, 2013 (ENS) – This morning Sarawak indigenous leader Peter Kallang, chairman of the SAVE Rivers network, which opposes a dozen dams planned for the rivers of Borneo, was barred from the first meeting of the International Hydropower Assocation’s World Congress ever held in Asia. The free-flowing rivers of Borneo, the world’s third-largest island, are at stake in the struggle of the island’s indigenous people against the Sarawak state government and hydropower companies over plans to build the dams that will flood their lands. Although Kallang had paid the IHA World Congress’ registration fee of US$1,750 and was a registered participant, he was told that he could not attend the workshop because he had written letters to IHA Chairman Richard Taylor critical of the IHA’s cooperation with the regime of Sarawak Chief Minister Taib Mahmud and the association’s policy of excluding affected indigenous people from the congress. Kallang lodged a police report against the responsible IHA representative, Douglas Smith, who apparently acted upon instruction of Sarawak Energy, a company that is wholly owned by the state of Sarawak, headed by Chief Minister Abdul Taib Mahmud. 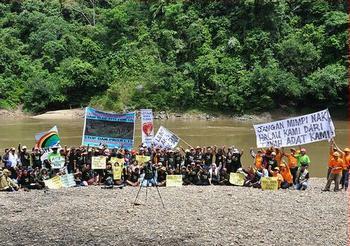 Environmental groups, including the Swiss nongovernmental organization Bruno Manser Fund, have condemned this attempt by the International Hydropower Association and Sarawak Energy to silence critical voices. The Bruno Manser Fund is demanding an immediate apology from IHA Director Taylor over the incident and a guarantee that Kallang and all indigenous and NGO representatives will be granted unlimited access to the International Hydropower Association Congress, which runs from May 21-24 at the Borneo Convention Centre in Kuching. With representatives from over 80 countries and representation from government, industry, research institutes, civil society, financial institutions and other international organizations, the event is key for hydropower professionals. “It is an absolute scandal that the IHA has chosen the Taib family’s Borneo Convention Centre for their congress,” said Lukas Straumann, director of the Bruno Manser Fund. “The congress centre’s operators are the very same people who are the main beneficiaries of Sarawak’s corruption-driven dam plans,” said Straumann. “We demand that the IHA immediately change the conference venue. Otherwise, the IHA will lose all credibility in addressing corruption in the hydropower sector.” But the venue was not changed and the biannual IHA event opens there on Tuesday. The Malaysian state of Sarawak, a state the size of England on the island of Borneo, has been shaken by a number of high profile corruption scandals involving Chief Minister Taib and his family. Research by civil society organizations, such as the Bruno Manser Fund, Sarawak Report and Global Witness, has uncovered corruption under the state government of Taib, who is one of Asia’s longest-serving politicians. In June 2011, Malaysia’s anti-corruption agency, MACC, opened a formal investigation into Taib’s activities, which is still ongoing. Taib’s latest economic initiative is the so-called Sarawak Corridor of Renewable Energy, SCORE, an immense industrialization program with planned investments of up to US$105 billion. New dams as well as new coal-fired plants are planned in order to feed energy intensive-industries such as aluminum smelters. SCORE is not restricted to the power sector but also includes a large infrastructure development plan with intensified tropical hardwood logging and the large-scale expansion of oil palm plantations5. “Taib Mahmud’s numerous family businesses are expected to be among the main beneficiaries of SCORE,” says the Bruno Manser Fund in a report released today timed to attract the attention of the participants in the IHA World Congress. 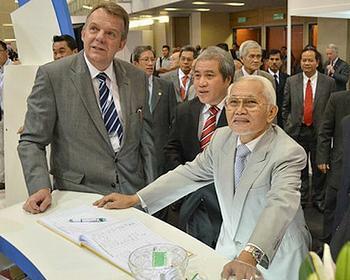 “Chief Minister Taib Mahmud and his entourage are relying heavily on international expertise for implementing SCORE,” states the report, which takes aim at one of the key figures behind SCORE, Norwegian national Torstein Dale Sjøtveit, CEO of Sarawak Energy and a board member of the International Hydropower Association. The Bruno Manser Fund report alleges that, during Sjøtveit’s four-year tenure as CEO, Sarawak Energy has granted contracts worth over 680 million Malaysian Ringgit (US$227 million) to companies linked to Taib’s family. The report calls on the international community to shun Sarawak Energy as a business partner. 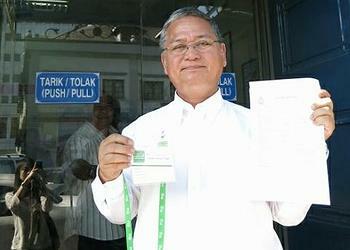 “IHA is advising the Sarawak government and will showcase its efforts at next week’s congress. The Sarawak government will also use the opportunity to reach out to potential investors,” wrote Herbertson. Critics of the destruction of Sarawak’s natural resources are running into opposition elsewhere as well. Halfway around the world, in London, UK last week, English author, actor, comedian, artist, naturalist and musician Bill Oddie was evicted from HSBC’s London headquarters while protesting against the bank’s business ties to companies that are illegally destroying rainforests and abusing human rights in Sarawak. Oddie teamed up with the campaign group Global Witness to expose how the UK’s biggest bank has made almost £100 million by providing loans and services to some of the most destructive logging companies in the world, in violation of the bank’s own policies. A short film made by Oddie and Global Witness pokes fun at the bank’s hypocrisy, but its message is serious. A public petition launched with the film calls on HSBC CEO Stuart Gulliver to end the bank’s relationship with the companies destroying Borneo’s last virgin rainforests.